Mom of 2 ninjas This was a must while shopping with one of my little boys. It is a great concept, my kids love playing with it in the bathtub however I don't love that the cord has become moldy after only a few baths. I remove the pole from the water and rinse it after each bath but it does not dry completely which has resulted in trapped water causing mold. I have soaked it in a cleanser to remove the dirt and it it now clean but it won't last long. Cris mom This is a great bath toy. I love the clean design, hopefully it will not get mold in the future. It is very easy to use even for a little kid. My daughter spends a lot of time trying to catch the fishies, which it makes bath time fun and challenging. JustAMom This is a great bath toy. I love the clean design, hopefully it will not get mold in the future. 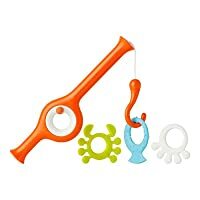 Mom of multiples Our 3 year old son loves his fishing pole. He looks forward to playing with it at tubby time every night! VLively My kids love this toy, and use it all the time. J My 19-month old loves this toy!